Preheat the oven to 425 degrees. Butter a baking dish and set aside. In a large mixing bowl, whisk together the milk, eggs, melted butter, vanilla caviar, and apricot brandy. Blend in the flour and baking powder. Whisk for a full minute. Pour the batter into your prepared dish and bake until the pannekoeken is puffed and golden, approximately 30 to 35 minutes. Cut into slices and serve with smear of apricot jam and a dollop of whipped cream. *Below is an affiliate link for some of the products I used in this recipe. If you choose to purchase this way, I do receive a small portion of the sale. The Secret Recipe Club has started a new - fifth Monday - event that blurs the lines between the groups. You can be assigned to any other participating blogger in groups A through D. Naturally, I jumped right in. Our theme this month: Tailgate Eats. I was assigned to Burnt Apple, a blog written by Traci. This is a totally new-to-me blog. Woohoo. I chuckled aloud at her story about why 'burnt' is part of her blog name. She shares: "Twelve years ago, my husband threw one of my muffin creations at the wall of our apartment and made it go right through the wall. ...I couldn’t cook to save my life. I hated cooking and we ate out at least three days a week." I love that she is an admitted master recipe manipulator, making recipes healthier and still great-tasting. That is an art! I feel I should admit that I don't tailgate. I'm not a big sports fan. But I can always get behind any gathering that involves food. So, I imagined what I would want to eat huddled around a parking lot while drinking beer out of cozies. Her Honey Garlic Meatballs, Southwest Deviled Eggs, Ultimate Beef Nachos all caught my eye. But in the end, I decided to make a version of her Baked Macaroni and Cheese Balls. I love that her recipe includes pureed butternut squash. 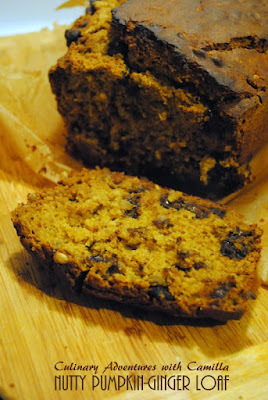 It's almost pumpkin season; I'll definitely make this again with pumpkin puree! I did have to change somethings around to make this gluten-free and dairy-free for my husband. Cook macaroni according to package directions. Drain, then set aside. In a saucepan, combine the pureed squash, broth, milk, pepper, salt and 1 T flour over medium heat. 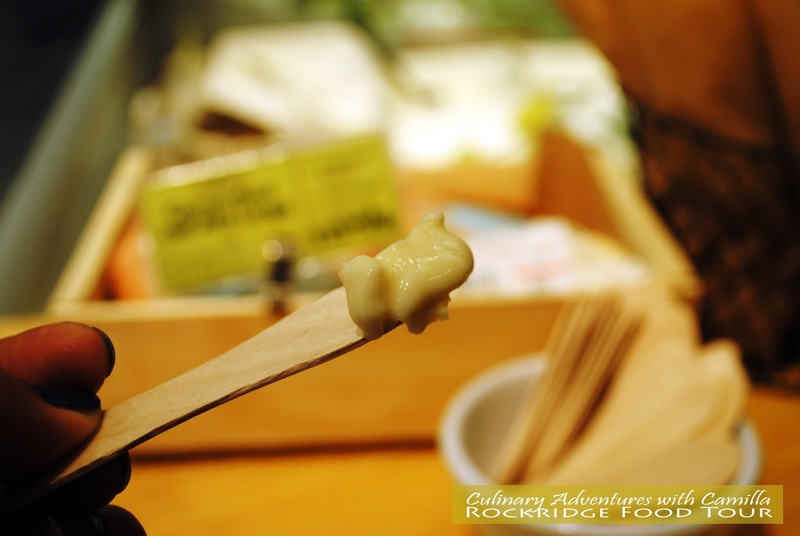 Heat until it boils, then reduce heat to low and slowly stir in cheeses. Once cheese is melted, stir in the pasta and coat in the cheese mixture. Place mac'n'cheese in the fridge to cool. Preheat the oven to 425 degrees F. Place the flour, eggs, and breadcrumbs in three separate bowls on your counter, then make tablespoon-sized balls out of the mac'n'cheese. Dredge each ball completely in the flour, then the eggs, then the breadcrumbs. Place the balls on parchment-lined baking sheets. Place the balls into the oven and cook at 425 degrees for 10 minutes. After 10 minutes, flip each ball to the other side to allow for even cooking. Cook for an additional 10 minutes. For crispier ball, turn the broiler on and broil them for an additional thirty seconds to a minute after cooking before flipping and broiling on the other side. The balls are done when crisped and browned. Remove from the oven and serve warm with marinara sauce. The first time I made these, I sent a photo to a friend. He requested them for a potluck dinner we were attending with some friends from high school. Done. These were a hit then, too. One of the benefits of having a best friend whose kid attends school with my kids: we can co-teach a class! 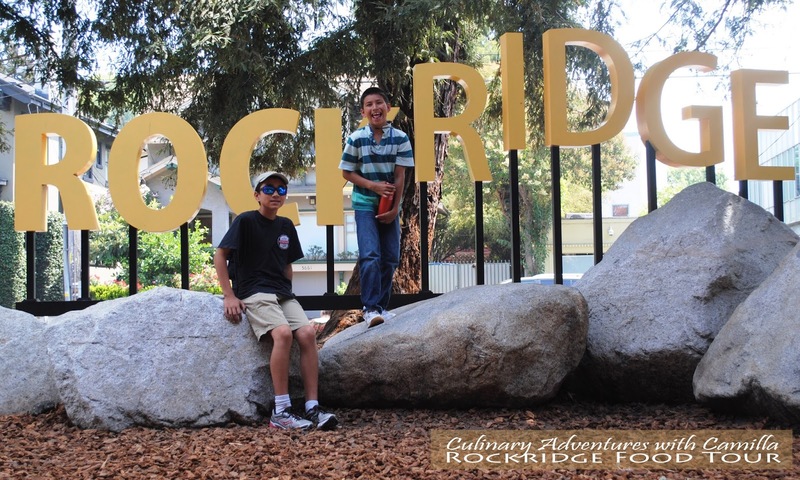 Our boys' school has 6-week elective courses that are volunteer-led called SEMs or Schoolwide Enrichment Models. I've taught several through the years; Jenn is new to the SEM world since this is the first year that G can take one. So, she wanted to teach together. Perfect. Naturally it has to involve food...and science. To include all three of our kids, this is going to be an all grades class. Yikes! I've never had the span of 1st graders to 8th graders. This will be a culinary adventure. We are still working on our syllabus, but we plan to cover emulsification, fermentation...not sure what else. It's a good thing we have till February to plan. Stay tuned. What do you need to make a great pasta dish? Great tomato sauce! This is the sauce I used in my Spaghetti and Meatballs for Brian and Jakey. I love making homemade tomato sauce. I sometimes make a super quick version, but this one has more complex and developed flavors. It's worth the two to three hours if you have the time! 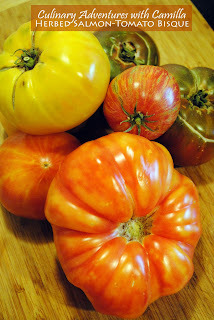 I also love that the tomatoes can be a little bit battered. If you have some ripe, but bruised, tomatoes, this is the perfect things to do with them. Chop all by one of your tomatoes. Puree them in blender until smooth. Chop the last tomato and set aside. In a large pot or Dutch oven, cook onion and garlic in olive oil until the onion starts to soften and become translucent, approximately 5 minutes. Pour in pureed tomatoes and wine. Stir in chopped tomato and herbs. Place bay leaves in the pot. Bring to a boil, then reduce heat to low, cover and simmer for 2 hours. Stir in brown sugar and simmer - uncovered - for another 30 minutes. 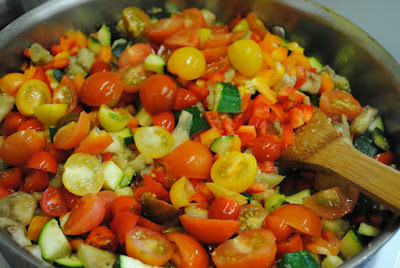 The sauce will reduce, thicken, and turn darker as the tomatoes caramelize. Adjust seasoning as needed. Discard bay leaves before serving. As Jake's gluten-free, dairy-free experiment continues, I am having to do some experimenting of my own. Earlier this week I decided that I wanted a creamy alfredo penne with my roasted salmon. As it was, I told the minis it was gluten-free and dairy-free; it was received with a roll of the eyes. Had I not told them, I'm not sure they would have made a peep. It was good...and easy! Actually, making this dairy-free alfredo was easier than making a regular alfredo. Soak the cashews in water over night. Drain. 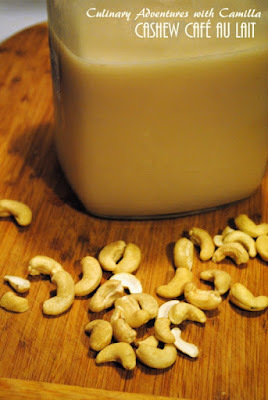 Place soaked cashews and 1 C water in a blender. Blend till completely combined and smooth. In a large, flat-bottom pan, melt the butter and cook the garlic until softened. Pour in the cashew cream and stir to combine. Add in the cheese and stir again. 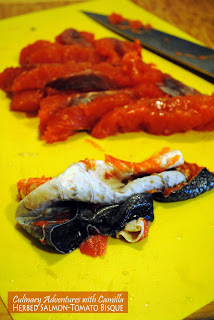 Season to taste with salt and pepper, then fold in the cooked pasta. Add a splash of olive oil to make it glossy. Serve immediately with another sprinkling of cheese. Rhubarb tart is pretty much my family's favorite dessert of all time. I don't know if it's because rhubarb season is so fleeting that this tart is something they dream about for the rest of the rhubarb-less year - or if it just really is everyone's favorite. There's the puckering tartness of the rhubarb, the toothy bite of the crust, and the slightly caramelized crisp of the brown sugar on the top. It is pretty fantastic. So, when Jake decided to do a gluten-free, dairy-free experiment and the boys and I found rhubarb at the market, they whined: "You can't make rhubarb pie because Daddy's gluten-free and dairy-free!!" I assured them that I could certainly try to make one. Making the shift to gluten-free and dairy-free baking has been a lot of trial and error for me. But, with this, I think I got it! Using a pastry blender, or the tines of a fork, blend all the ingredients - except the water and gin - together to form pea-sized chunks. Add the liquids and gently press together until it forms a ball. Press the dough into a greased tart pan and place it in the freezer. Preheat the oven to 375 degree F. Place in the oven and bake for 20 minutes. Prepare the filling while the tart crust bakes. In a large mixing bowl, toss together the rhubarb, brown sugar, flour, and butter. Spoon the mixture into your tart crust - it will be rounded over the top of the crust - and bake for 15 minutes. Gently press down on the rhubarb, compressing the pieces down into the crust. Bake for another 15 minutes. Press down on the rhubarb again. Then sprinkle the top with brown sugar. Return the tart to the oven for another 10 to 15 minutes. The crust should be firm and lightly golden, the rhubarb soft, and the brown sugar caramelized and bubbling. Let cool slightly. Serve warm. Earlier in the summer, Brian and Jakey embarked on a culinary adventure of their own - to find the best spaghetti and meatballs on the peninsula. I offered to be the last stop. La Cucinotta di Camilla. Last night was my night. I initially planned to make everything from scratch, but I had stripped the gears on my pasta maker earlier but, my new one didn't show up until two hours after they left. Boo. I guess that means that I'll have to have them over for another round. Soon. Let's just start with this, though: 'spaghetti and meatballs' is not an authentic Italian dish. Spaghetti would be served as a primi piatti while polpetttine would be served as a secondi piatti. So, yes to spaghetti and meatballs being Italian...just not served together. That said, it's a favorite dish on our table and obviously is with the Garneaus as well. 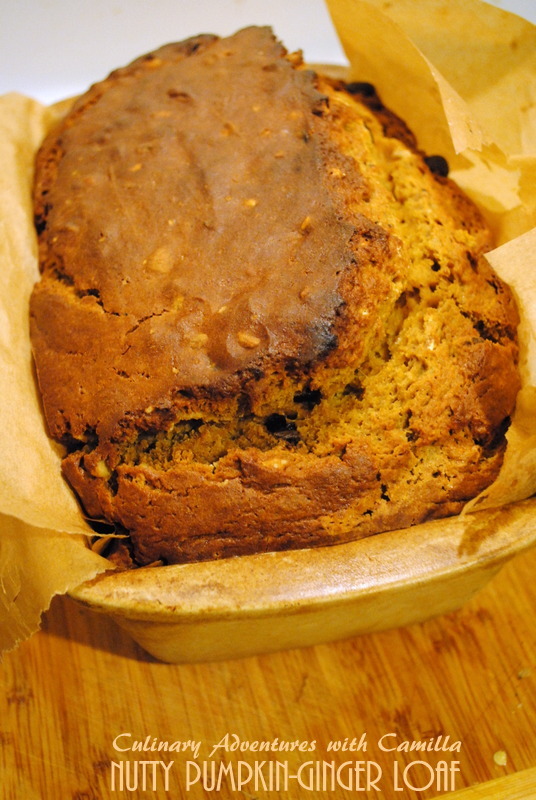 I did have to adapt the recipe so it would be gluten-free and dairy-free for my Jake. In a large mixing bowl, combine pork, beef, spinach, garlic, cheese, egg, fresh herbs salt, pepper, smoked paprika, and 1/4 C bread crumbs. Use your hands to mix all ingredients until well-combined. refrigerate for at least an hour and up to 24 hours, if you can. Place the remaining bread crumbs into a small bowl. Use your hands to shape the meatballs into rounds*, roll in the bread crumbs and place the meatballs on a parchment-lined baking sheet. Bake for 25 to 30 minutes - until golden and cooked through. While the meatballs roast, heat your homemade sauce and cook the pasta. To serve, toss spaghetti in as much as you like. Roll the meatballs in the remaining sauce and spoon on top of the pasta. Serve immediately with cheese on the side. *I made my meatballs golf-ball sized. If you make them smaller, or larger, adjust your time as needed. I've found that meatball preferences are very, very different! No verdict yet on how my spaghetti and meatballs stacked up to seven local restaurants who have it on their regular dinner menus. Brian and Jakey said they would complete their spreadsheet and let me know. They did talk about how they rated the restaurants and, so far, they thought that Gusto Handcrafted Pizza and Pasta had the best pasta while Il Vecchio had the best meatballs, I think. 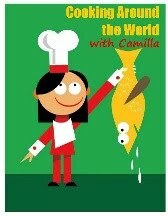 I will at least win on the 'best value' considering La Cucinotta di Camilla was free. And I will also win in the dessert category since I made Brian's favorite - rhubarb pie. Jenn told me that I was cheating and swaying them with my rhubarb pie. I consider it creating a strategic advantage; it's not cheating! Normally, I turn these ingredients - eggplant, zucchini, bell peppers, tomaotes - into ratatouille which, my version at least, is very fast and very loose. Here's one I did with the kids at school: click here. It's a veritable celebration of a garden's bounty...all tossed together in a pot. Now this looks like the dish that was called ratatouille in the movie by the same name. We can thank Disney for the culinary confusion. Well, for some of the culinary confusion. But who can forget how a single bite of this dish transports the restaurant critic to his childhood? That is a powerful dish. But, unfortunately, this is not ratatouille. Ratatouille and tian do have a commonality: their origin. 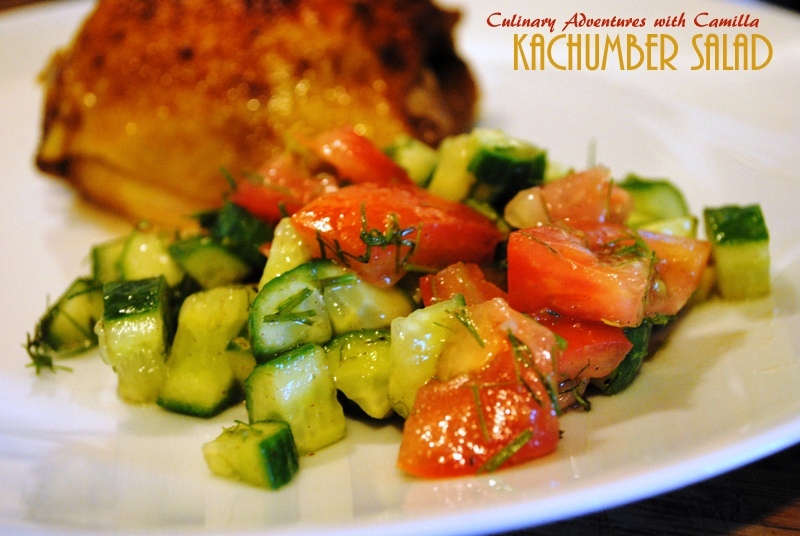 Both dishes are from Provençe and use some of the same seasonal produce - tomatoes, zucchini, onions, eggplants. In a ratatouille, the vegetables are cooked in chunks while it is the tian that uses those overlapping rows of sliced vegetables that are so pretty. Preheat the oven to 400 degrees F. Rub baking dish lightly with olive oil, then spread 1/2 of the garlic over the bottom. 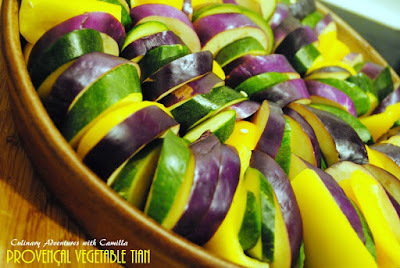 Slice the vegetables as uniformly as you can so that they will stack nicely in a pan. In a small saucepan, bring the sauce to a simmer and season with remaining garlic, salt, pepper, and fresh herbs. 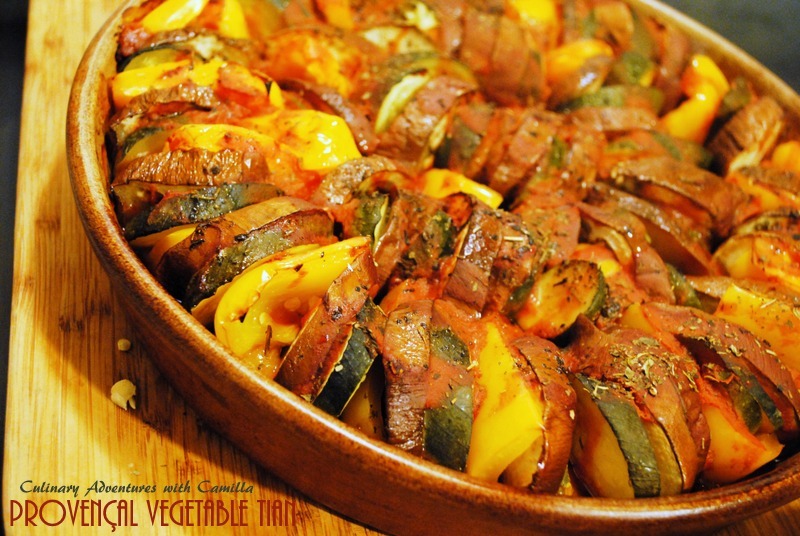 Arrange the vegetables in the pan, alternating between the eggplant, zucchini, and peppers. Drizzle the sauce over the vegetables, cover with foil and bake for 30 minutes. Remove the foil and bake for another 15to 20 minutes or until the vegetable tops begin to caramelize. Serve hot though it's also good cold. Some people when faced with a new-to-them fruit or vegetable will run the other direction. The Manns? Nope. We scoop it right up and wonder how we're going to eat it. I'm on the email list for a website - Local Harvest - that assists in my desire for culinary adventure. This week, I ordered some fresh khalal dates from Pato's Dream Date Gardens. Check these out! They're gorgeous. These Mariana dates - in the Khalal stage - are raw, fresh, and not fully ripened. They will soon enter the Rutab stage as they deepen to a deep gold color. And by the time they reach the Tamar stage, they'll have a firm chewy sweetness. I only hope that we can stay away from the bunch long enough to see it through all the stages. Or, I'll have to order more! I know, I know. I just made a snide comment about pumpkin recipe in August...talk about having to eat my words. But I have an explanation: I found a can of organic pumpkin puree that I must have stashed as an emergency back-up in case I ran out of fresh pumpkin puree last autumn. And I wanted to use it before we get back into pumpkin season. I know canned goods are meant to last. But, really, how long do they last?!? I try not to have an entire year go by with a can in my pantry. And, as Jake is on a gluten-free, dairy-free regimen, I decided to try my hand at a gluten-free, dairy-free pumpkin bread. Success! 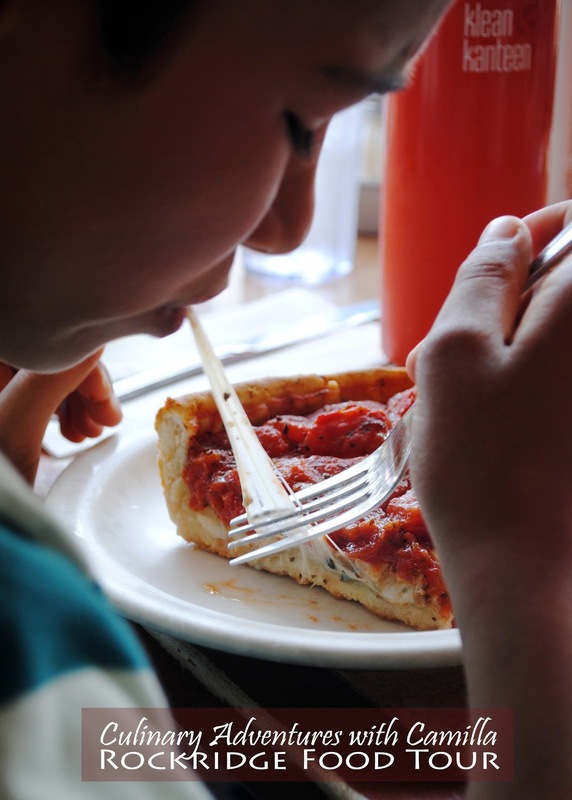 We shared a slice with a friend who was recently diagnosed with Celiac and she loved it, too. Woohoo. I will get a handle on this gluten-free, dairy-free baking thing. I will! Preheat oven to 350 degrees F. Line a baking loaf pan with parchment paper. Combine all ingredients in a large mixing bowl. Use a spatula to mix until just moistened. Pour into prepared loaf pan. Bake for about an hour, or until a toothpick inserted in the center emerges clean. Cool for 10 minutes, then invert onto a rack to cool completely. *Below are affiliate links for some of the products I used in this recipe. If you choose to purchase this way, I do receive a small portion of the sale. **If you are dairy-free, just be sure to read the ingredients on your chocolate chips. If you're reading my blog, you know that I love food. I love adventures. And I especially adore any adventure that involves food. 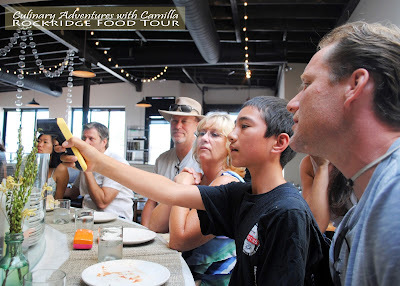 I became a food tour convert after writing this piece for Edible Monterey Bay years ago - Local Food on Foot: Two Unexpectedly Intriguing and Delicious Adventures. Since then, we've done a Walking Chocolate Tour in San Francisco, the North Beach-Chinatown Food Tour that included a Tea Tasting in Chinatown, and many, many more. Food tours are both tasty and informative. 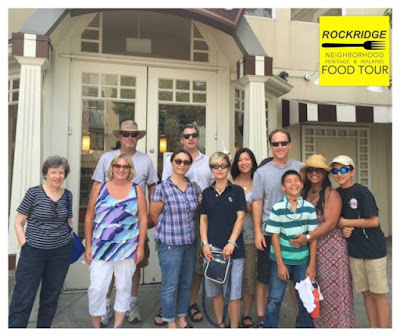 So, when the Rockridge Food Tour entered my radar, I scooped up four tickets and looked for a good weekend to head up to the East Bay. This past weekend was it. I enjoy how each tour guide infuses his or her own personality and interests into the talk. Claire ran the tour yesterday and shared fun stories about the historical players in the Rockridge area, including architect and first female civil engineer Julia Morgan and competing developers Frank Havens, "Borax" Smith and John Spring who all played a game of checkers with the stakes being the Claremont Hotel property. As legend has it, Havens won. These are not all of the stops. These are just the highlights. To read my thoughts on the individual businesses, click on their (hyperlinked) names. We started off with pizza at A16 and learned all about the VPN certification. That's Verace Pizza Napoletana. 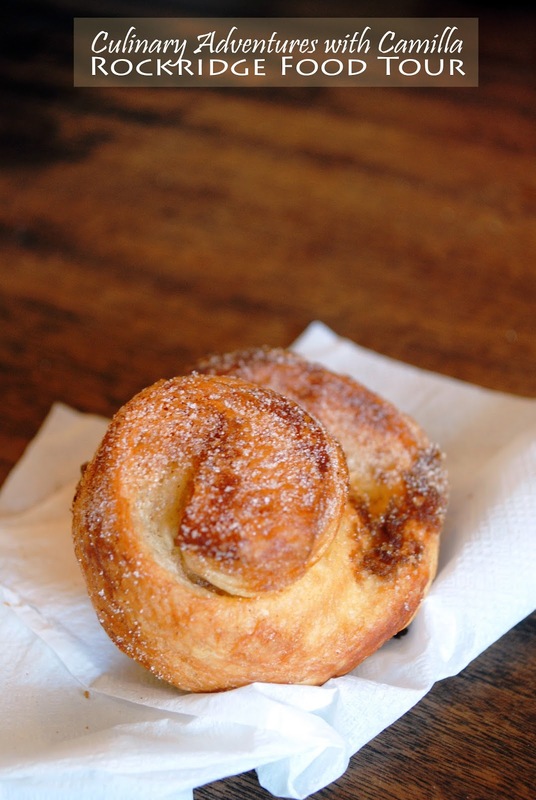 A stop at La Farine had us eating morning buns. Those are a family favorite and these didn't disappoint. We didn't spend nearly enough time in Market Hall. Seriously, I could have wandered around in there for hours. We tried some Golden State Cider with our pizza at Zachary's Chicago Pizza. What an enjoyable couple of hours spent exploring the foods of Rockridge! After the tour, we headed to the Elmwood and the Gourmet Ghetto for a few more of our favorites. I miss the culinary diversity of the East Bay. I'm glad it's within easy day-tripping distance. 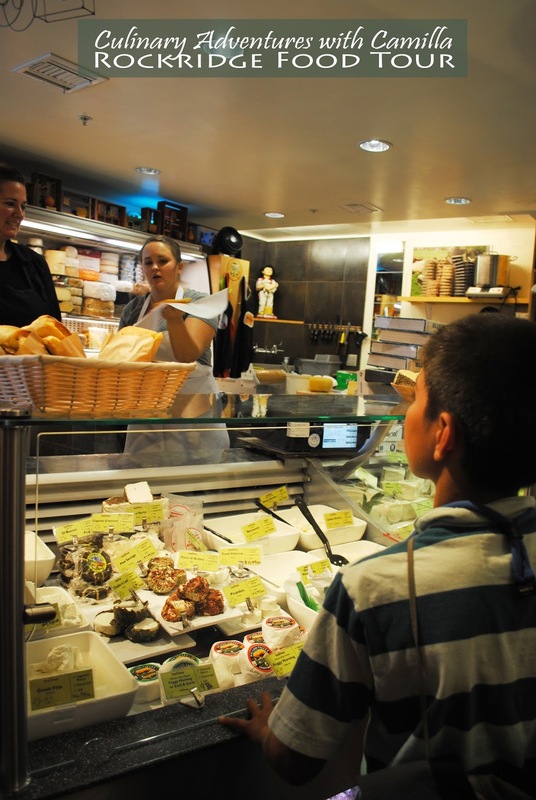 Market Hall is Rockridge's version of a French marché. Like European markets, it's a veritable feast for the senses. Things are open and aromas waft through the air. It's colorful and chaotic very unlike our staid American markets. I love it! You can get libations from Paul Marcus Wines, beans from Highwire Coffee Roasters, fresh seafood from Hapuku Fish Market, and so much more. But our stop - for the tour - was the Pasta Shop. Pasta and cheese. 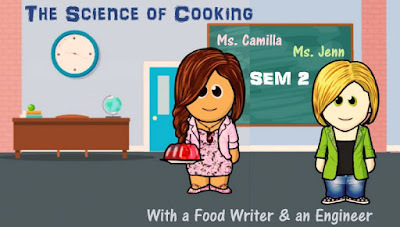 You know we were in culinary bliss. 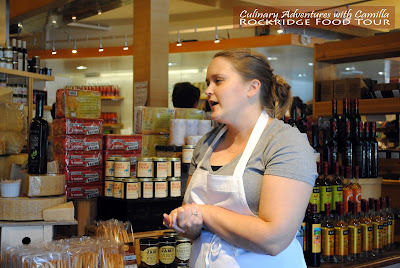 Cheesemonger Jane Lyon spoke to us and had us try several different cheeses. 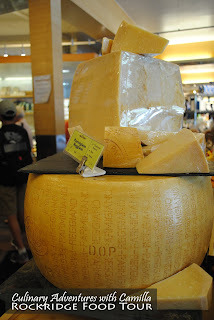 Lyon was one of the top ten finalists of The Cheesemonger Invitational in San Francisco. She described the competition and spoke passionately about cheese. She was impressive. After she spoke, and we sampled, we were free to roam the market. The Enthusiastic Kitchen Elf and I made our way to Lyon's counter and tried several different bleus and all three of the feta cheeses they offered. 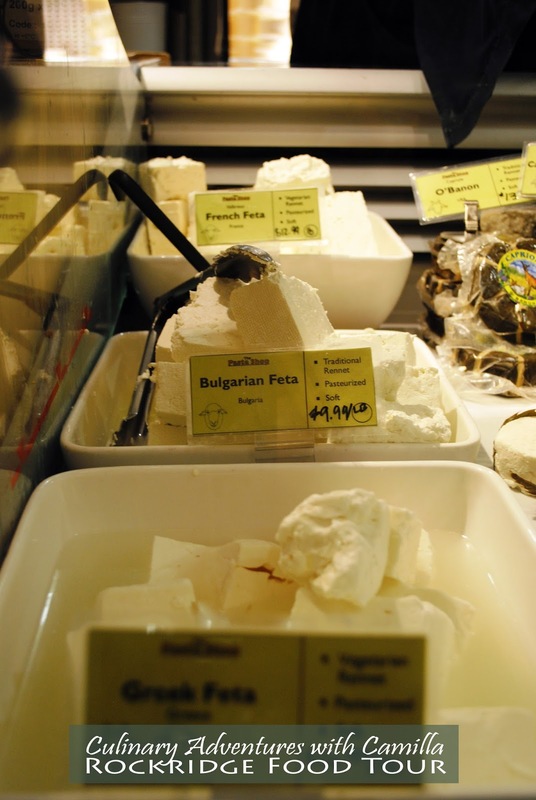 It was jarring to see how different the French feta was in comparison to the Bulgarian feta and to the Greek. One was more citrusy; one was more sharp. All were delicious, but we couldn't decide on a favorite. That just means we'll have to go back and try them all over again. We also tried two different camemberts. I love that stinky creaminess! 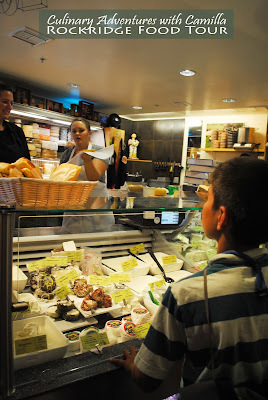 I'll be looking at our calendar to plan another family field trip to Market Hall. Who's in? 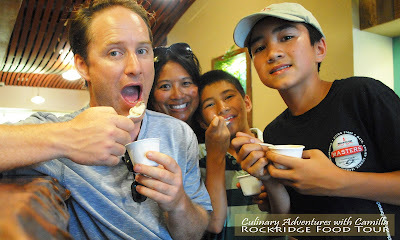 Chicken Tikka Masala is a family favorite. I know, I know, we have a lot family favorites. But lamb, on the other hand, has really only been a favorite with the talls in the family. I'm not sure I can still call us that, given that our 13-year-old sprouted this summer and is taller than I am. But, you know what I mean. Recently, however, both boys have asked to try lamb from our plates. And both have liked it. So, this past weekend, we made a huge pot of Lamb Tikka Masala. Winner, winner, lamb dinner! Combine all of the ingredients, except the ground nutmeg, in a medium skillet . Over medium heat, toast the spices for approximately 3 to 4 minutes. Remove the mixture from the heat and let cool until you can bear to touch them. Once cool, add the toasted mixture and nutmeg into a spice grinder; I use an old coffee grinder. Process you get a fine powder, approximately 1 minute. Use right away or store in an airtight container for up to 1 month. Combine the first five ingredients well and massage them into the lamb. Add 1/2 C yogurt and toss to coat. Refrigerate for at least 30 minutes. Heat the olive oil large, flat-bottom pan. Saute the onions, garlic, ginger, turmeric, and chile until the onions are softened and translucent. Add in the meat and cook for 4 to 5 minutes. Add in the tomatoes 1/2 C coconut milk. Bring to a simmer. Cover and braise for 2 hours minimum. You can go longer, if you have more time. The longer you cook it, the more tender the meat will be. Fold in the remaining coconut milk and remaining coconut yogurt. Heat to warm. Stir in fresh herbs and serve with rice and Kachumber Salad (recipe is included in a recipe round-up I did for The Bookclub Cookbook Project). 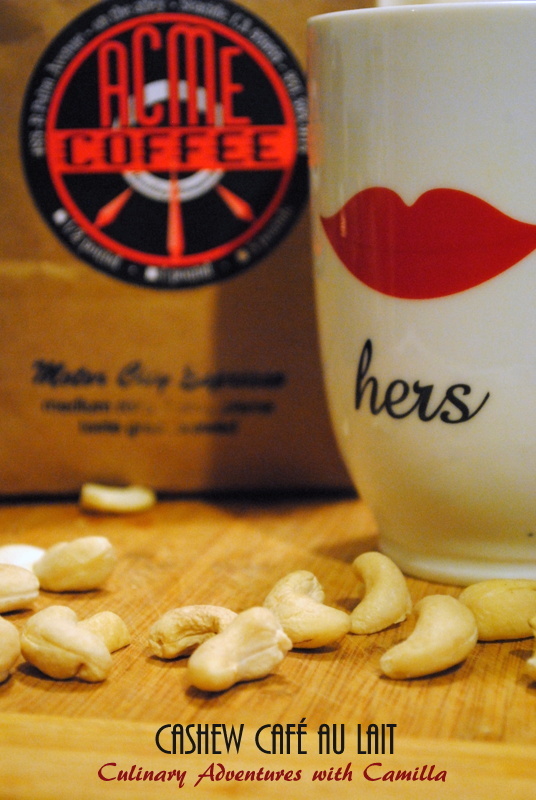 I thought about all the possibilities and decided to use cashew nuts to make a dairy-free milk creamer for a New Orleans-style Café au Lait. My husband has recently decided to cut out dairy. So I'm on a dairy-free adventure. It's all new to us. 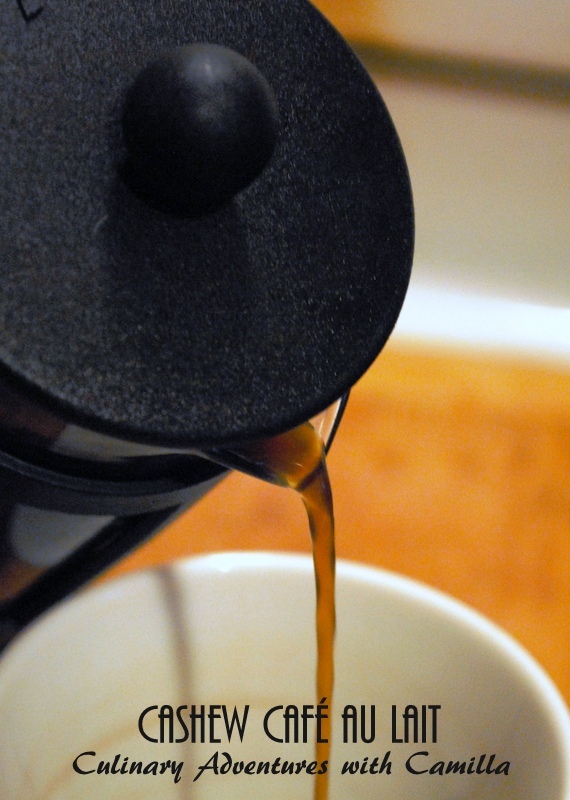 A café au lait is French pressed coffee to which steamed (or warmed) milk is added; it differs from a caffè latte which uses espresso as its base. 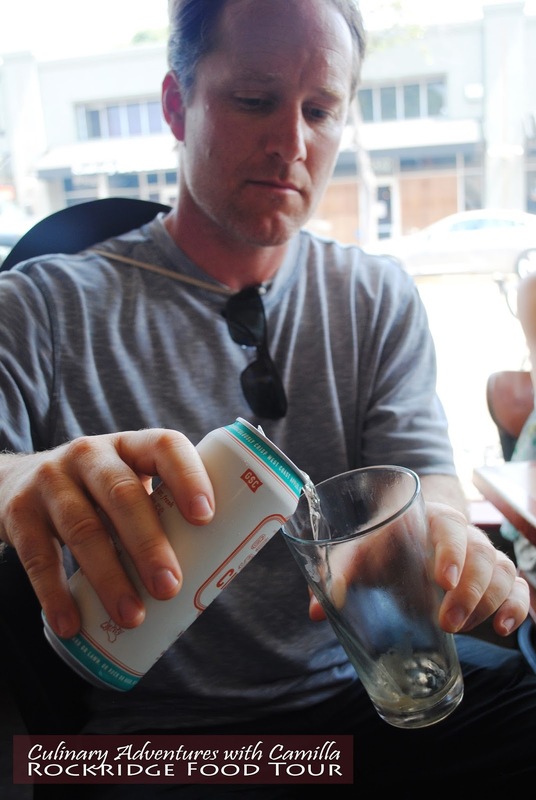 While I typically lean towards a latte, Jake prefers the au lait and he really appreciated the dairy-free effort. Place cashews in a lidded jar and fill with water so that the cashews are submerged. Cover with lid and let soak over night, or at least 8 hours. Drain and rinse. Place cashews in blender with 1 C cold water and blend until completely creamy. Add in more water, 1/4 C at a time, until desired consistency. I probably used another 1/2 to 3/4 C. Stir in final ingredients to taste. Blend to completely combine. Refrigerate. It should last for about a week. We went through ours within four days and my husband asked when I was making a new batch. In medium saucepan over low heat, heat cashew milk creamer until bubbles form around edges. Whisk to froth, if you like. To serve, pour equal parts coffee and equal parts warmed milk in a mug. Serve with option condiments, if you like. I like mine dark and bitter, but Jake prefers it more sweet and spiced. *Just a few notes on the coffee...I am admittedly a little bit coffee-mad. Here's an article I wrote about coffee for Edible Monterey Bay a few years back: click here. Here are the talking points: buy in small portions from a micro-roaster. I love a local-to-me mom-and-pop place called ACME Coffee. But I'm sure you can find something similar...you just need to look. Buy whole beans that are not dark roasted. Seriously. Dark roasting is the great equalizer. All beans taste the same once they are dark roasted. Buy a high quality bean in a medium to lighter roast and taste the difference. It's like wine; you can taste characteristics in the bean from where they were grown. And, lastly, grind as you go. Bid adieu to dark roasted, pre-ground coffee. You'll thank me! 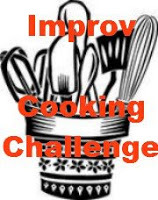 It's time for August's Improv Cooking Challenge hosted by Lesa of Edesia's Notebook. I don't know where the weeks are going. 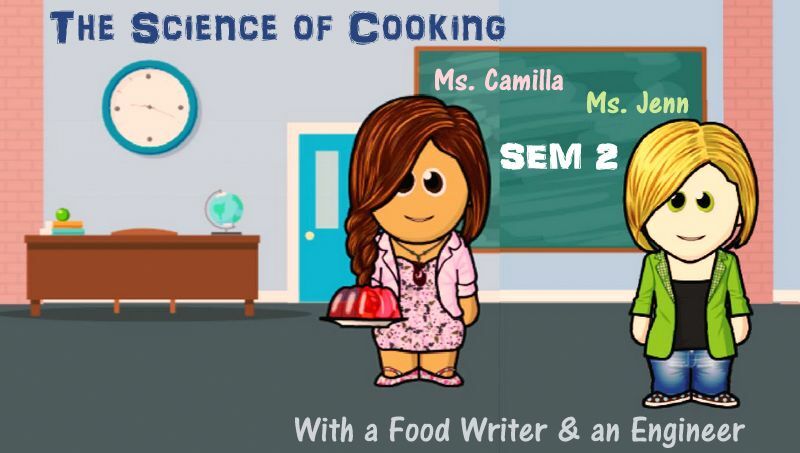 The idea of this challenge: we are assigned two ingredients and are tasked to create a recipe with those two things. August's assigned ingredients: tomatoes and herbs. Perfect timing! Summer tomatoes abound and fresh herbs are all over my son's garden. 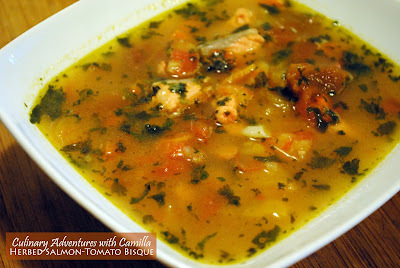 Since salmon is still to be had in our bay, I decided to pair them in a filling summer bisque. Bisques, after all, have to be made with seafood...otherwise, they are just soup! 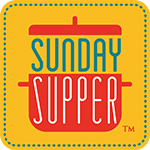 Melt butter in a medium stockpot over medium heat. Add leeks and garlic and cook until the leeks are translucent and softened. Pour in the fish stock and clam juice; fold in the salmon and tomatoes. 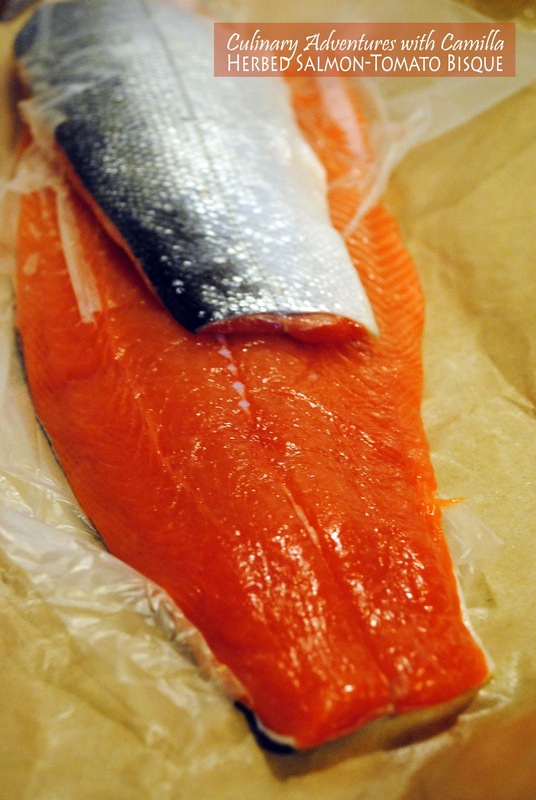 Bring to a boil and cook until fresh salmon is cooked through approximately 5 minutes. Fold in the herbs, then season to taste with salt and pepper. Serve immediately. You can certainly blend it smooth with an immersion blender; I left ours chunky and rustic.